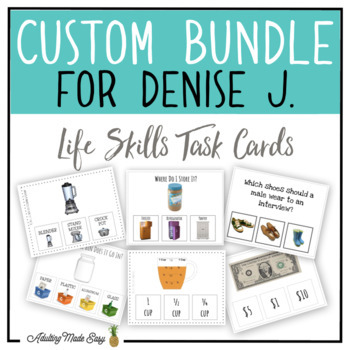 CUSTOM TASK CARD BUNDLE FOR DENISE J. THIS IS A CUSTOM BUNDLE FOR DENISE J. - DO NOT PURCHASE (unless you like what this bundle has to offer!) 22 task card set bundle. Does It Go In The Sink or Trash? How Much Change Do You Get Back?